Wash and wipe the okra and cut it into small rounds. Chop Onion finely. Chop garlic flakes lengthwise. In a kadai put the oil and when it is hot add mustard. When it pops up add urad dhal and peanut. Fry till the urad dhal turns light brown. Then add garlic flakes and fry for few seconds. Add chopped onion and coriander leaves and fry for few more seconds. Add the okra pieces and mix it well. Close with a lid and cook on low flame stiring now and then till the okra is cooked well. Add sambar powder, turmeric and salt and mix it well. Allow to fry till it become dry and crisp. I am a very frequent visitor to your website.. tried a number of your recipes and they have all come out well.. thanks. Just one question, in this recipe, is it raw peanuts that you have used? Thank you Jaya for writing. I have used fried peanut. If you use raw peanut, it will not be crisp. You can just fry it in a dry kadai and then use it. Tried this dish at home…came out very well…ppl at home live it…I’m a fan of ur recipes…keep up the good work.. Thank you Madhu for the kind feedback. I have tried some of ur recipies, & My people are wondering what has brought the sudden change in my cooking… & I am keeping it a secret…Thanks to u…. Glad to note that my recipes of somewhat useful to you. At the farmers market the okra has been puzzling. Even though picked young, sometimes it is woody and sometimes if you run your finger across the edible green skin it has hairs that feel painful and sharp like needles or a razor! Why the okra does this and I assume in both conditions it should be avoided, like one should never cook it with those sharp razor like hairs? Some variety of okra has the sharp hairy like skin. But when you fry it in a little oil, it will not give any harm. You can use it in any dish. Thank you for your kind words. Yes. Sambar powder is the same kuzhambu podi. Actually I prepare sambar powder as per the recipe available at this site and use it for all sambar/kuzhambu/kootu recipes. 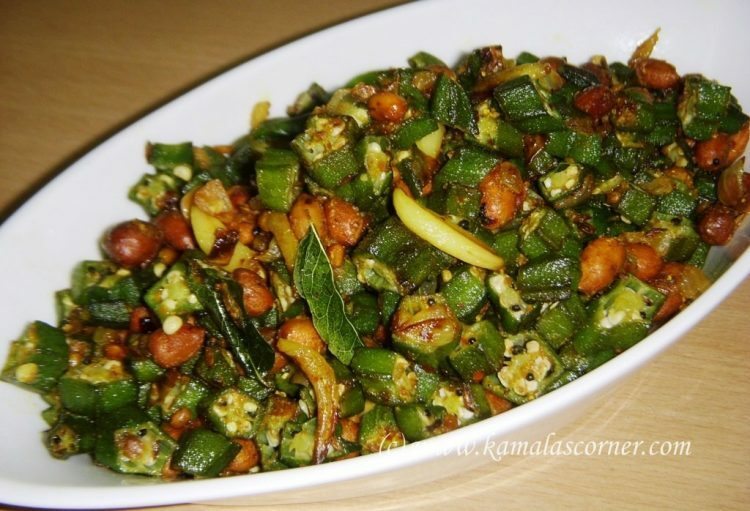 I am a big fan of your website..could you please suggest how to get okra more crispy and not sticky. usually when i cook it becomes soggy and sticky. Thank you for visiting our site. To remove stickiness from okra to some extent, you can add ateaspoon of curd or lemon juice while frying okra. However you cannot completely remove the stickyness. If you deep fry, then it will be crisp and taste like pakoda. its been long time i surfed your site .i was typing padmas corner as i had forgot your name.i felt hesitated but i could get back to your site. you make a difference to our everyday cooking.every dish of yours is a click and makes us repeat it.commendable job. Thank you Poornima for revisiting my site and your kind words.